I was quite productive last Sunday. I got up earlier than I am wont to do when I don't have to be anywhere. It's been hot and humid so the AC is on, even though I keep it at 78-80. I figure 78-80 non-muggy degrees is sufficiently comfortable for me AND the cats. Anything lower is a waste of energy. 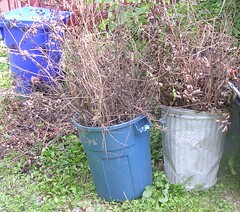 My first completed task last Sunday, before the day got hot was to bag up two more containers of yard waste. This is left over from Carole and David's visit. I have not felt like going out and shoving more branches into containers. Now, I need to go get yard waste stickers so these can be taken to the curb and the last little bit, which you can see on the ground behind these two can but put in cans and taken to the curb. 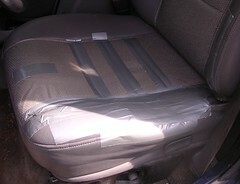 When that was done, I fixed my driver's side seat in the Jeep. It's the original 1997 seat and, quite naturally, has started to split and crack in places. It's still incredibly comfortable, as Jeep seats go, but even the seat cover couldn't hold it together. All I can say is, "Red Green would be proud." I have to wash the seat cover. I hit a bump and spilled Dr Pepper all over me and the seat cover and then didn't put the windows up when we got a half-inch of rain three weeks ago. I thought about taping the other seat so they match, even though the other seat has no cracks. 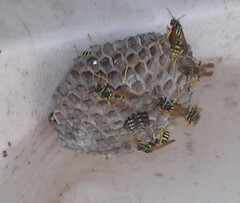 Then I sprayed the yellow jacket nest in my storage shed. I'm really the kind who understands these insects' roll in pollinating crops and killing pests. They are not as efficient as bees because they don't visit the wide variety of plants that bees do. Yellow jackets are attracted to sugar so they will pollinate nectar producing flowers but also go after soda cans and tree sap. They are really aggressive when disturbed and can sting repeatedly. I had a small nest in the corner of the deck which I was able to dislodge with the broom. This one, being in the shed, had to be killed so they would go somewhere else. I can't get things out of the shed if I have to worry about a nest. Nests are used just once, so those gigantic basketball-size nests you see are maximum size and are a one-year thing. That's 10 to 15,000 yellow jackets. I hosed it down with flying insect killer. I need to look this weekend to make sure it's inactive and then remove it. The final task I actually finished last night, which prompted me to write up this post. 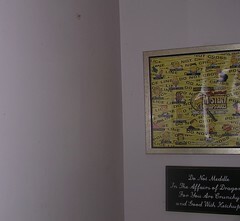 I have this corner of the hall that had a poster which wouldn't stay up on the wall. 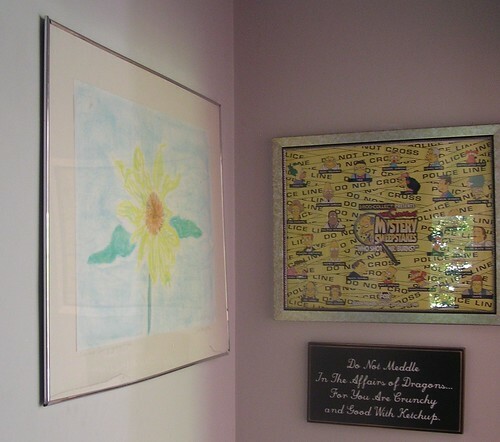 I drew a sunflower some years ago, when I was in therapy. I liked the image and framed it. It had hung in this corner for awhile but the hanger on the back of the poster frame kept falling out. I didn't want to replace the poster frame. It's lightweight and perfect for the drawing. In the 3M furnace air filters that I buy they include these picture hanging strips. As I always buy air filters and then try to remember to change them every 3 - 4 months, I have received well over a dozen of these little packages. I finally decided this was the perfect picture to try to hang using them. First, you have to wash the wall with rubbing alcohol and then attach one side of the strips to the wall. They don't recommend you put these on wallpaper. This is paint so, in theory, if I go to change the picture, I can remove these without damage to the wall. They tell you to attach the hangers to the wall and let them set for an hour. Okay, I attached the hangers to the wall, matched up another set and attached that to the back of the frame and let them sit, intending to come back in an hour and hang up the drawing. Well, if you know me, you know what came next. I got distracted by bright, shiny something else and didn't get around tuit until last night after a Great Lakes SEE meeting. I picked up the poster, matched the hangers with each other and pushed each one onto the ones on the wall. There was an audible "snap" when they were together. Viola. So far, so good. It seems held to the wall very nicely. The poster frame is lighter weight than something with glass would be at this size. I think this weekend, I'll tackle some sorting. I've been in a bit of a pothole and actually accomplishing things helps me see a bigger picture.